Custom built country oasis in the city sitting on 1.8 acres w/amazing mountain view! 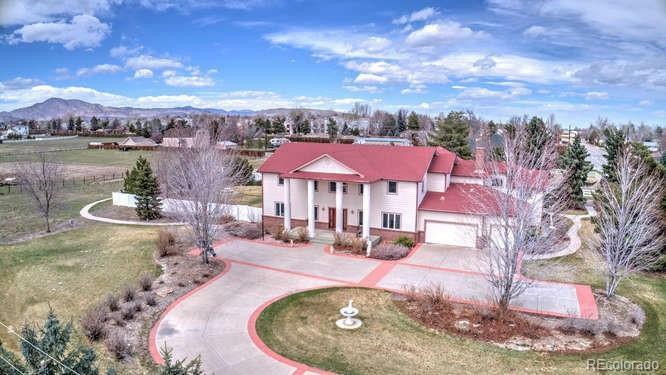 Minutes to Hwy 6, Hwy 285, & C-470, easy access to mountains & city center. Shopping & grocery stores are within walking distance. Amazing open floor plan w/custom finishes throughout, a warm home w/lots of room to entertain friends & family. Large master w/fireplace, large sitting area, & marble countertop bathroom w/double-size Jacuzzi & walk-in closet. Huge dance hall w/high ceiling & wet bar allow you to entertain up to 40 of your close friends. In-suite guest rooms are perfect for visiting family members. Walk out to an entertainer's backyard w/mountain views, patio, hot tub, koi pond, walking path, & beautiful landscaped garden. Main floor boasts of rich hardwood floors, custom kitchen, living room w/fireplace, formal dining room, family room w/wet bar, 3 car garage provides plenty of storage. It's the dream home you've been looking for in a convenient location. Unbeatable price $174/sq ft.